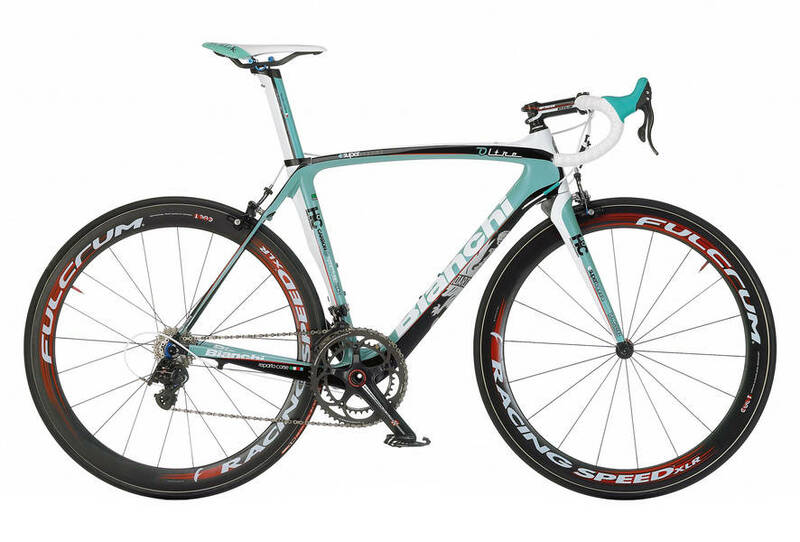 Here are the two newest, top-of-the-line road bikes from Bianchi, The Oltre Super Record and the Oltre Dura Ace (for those on a budget). 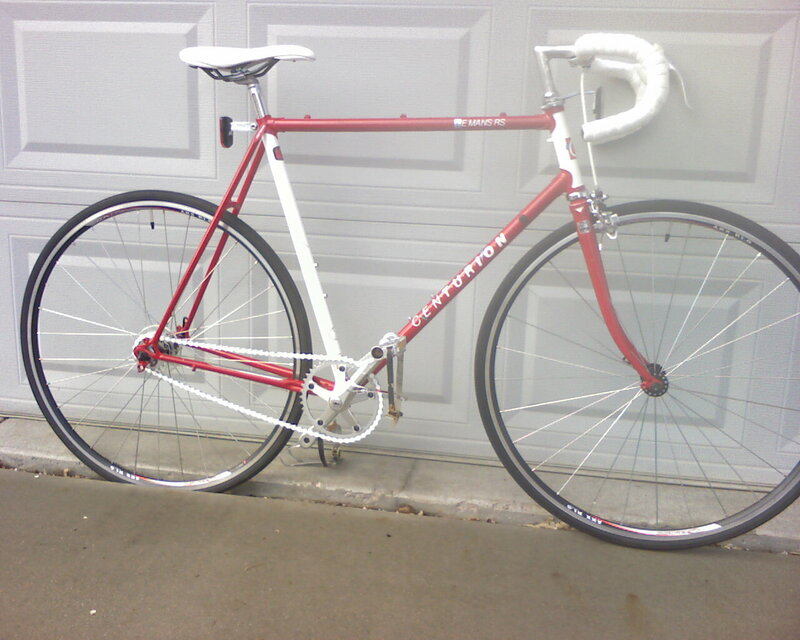 My dreams of the ultimate road bike do not reach quite this far, but they sure are fun to look at. Below are some thoughts I posted the day after completing The Ride last year. Although I made a few errors in this post, the feelings and thoughts expressed are still valid today. Today, I’m even more amazed that I accomplished what I set out to do – with some help, of course. I really doubt if I could do it again today. Last year, I had to get to Denver somehow, and the challenge of riding seemed like a great way to do it. Today, though I miss being on the road, I’m afraid I’m a bit too comfortable to challenge myself with a similar adventure. I hope you’ve enjoyed my attempt to relive some of what I experienced last year, just as I hope you enjoy the continuation of this blog. Denver has always felt like home to me; since we first moved here in 1983, when I visited after moving to Phoenix in 2001, and now, returning in an effort to restart my career, and life. Being here with Andi and Darryl, two of the best friends a person could hope to have, is so comfortable, and comforting. Hearing the delight and pride in my daughter’s voice last evening when I called and told her I’d made it brought me a sense of real joy. Seeing some of the old familiar places I remember from living here before gave me a wonderful sense of having returned to the place I am supposed to be. It is all so familiar and I am happy to be back. Yesterday, as I began my ride from Salida, I was so eager to get here that I began pushing very hard from the first crank of the pedals. This was, of course, a mistake. I blew up my legs very quickly. I stopped a couple of times for food and Rockstar to reenergize them but, even so, I knew I had created problems for myself by going out so aggressively. As a result, I had to begin hitching after about 30 48 miles. With a couple of tough climbs behind me, and a few more ahead of me, I decided I’d better hitch if I wanted to reach my goal for the day of reaching the town of Fairplay, about 60 50 miles from Salida. As it turned out, I received a ride from a lady named Mary Lou who has done more bike touring than I could ever hope to do. She drove me up the mountains and then out of the mountains into Denver, about 100 90 miles. She saved me at least three days of riding–perhaps four [due to all the climbing involved]. She also saved me from getting stuck in the mountains when another storm came in tomorrow. For this, I’m very grateful. I also learned some things from her about bicycle touring that I wished I had known before I began this journey. In fact, the whole trip, all 15 days, was an amazing learning experience. Some of the lessons I learned are internal, things I discovered about myself of which I’m proud, as well as things I’d forgotten about myself. Some of these lessons are things I’ll share with all of you later, some will remain my own. However, one of the most surprising and unexpected lessons I learned is something I’ve mentioned before; it is just how kind and generous people can be toward strangers. I had about half-a-dozen “pay it forward” type experiences during the 15 days I spent on the road. People offered encouragement, rides, and cash, expecting nothing in return and receiving only the satisfaction of helping another human being. I even had one completely anonymous contribution of cash at the hostel in Salida. Someone, I’m not sure who, hid a $20 bill in my riding gloves which I only discovered when checking my gear one morning. I have an idea who it might have been but, since they obviously wanted the contribution to be anonymous, I will honor their wish and simply say, “Thank you for being so generous. It came in very handy.” I have sworn, to myself and my daughter, that I will be just as kind and generous to others in the future. I realize now that I made many mistakes, in both the planning and execution, for this ride. I really thought I knew what I was doing after spending hours doing research online. Like most things though, it just isn’t the same until you’re out there, actually doing it. I mean, I spent years travelling alone as a salesman driving hither and yon but, living on the road on a bicycle creates a sense of exposure and vulnerability unlike any other mode of travel I can imagine. While I found a great deal of enjoyment in the experience, I also had days when I worked incredibly hard. Yet I did find bits of that joy and freedom about which I spoke before leaving. This ride was, without doubt, the most difficult thing I have ever done, yet I am proud and pleased to have done it. Many of the things I experienced and learned during this trek will take some processing to evaluate and understand before I am able to share them. Let me just say this, if there is anything in your life with which you might like to challenge yourself, something you might wish to do for you–and only you–please give it a try. While I was not able to pedal every mile of the way during my ride, this old man was able to do about two-thirds of the distance, nearly 500 600 miles; much farther than I could have imagined a mere year ago. So, whatever it may be that you have dreamed, make it real. 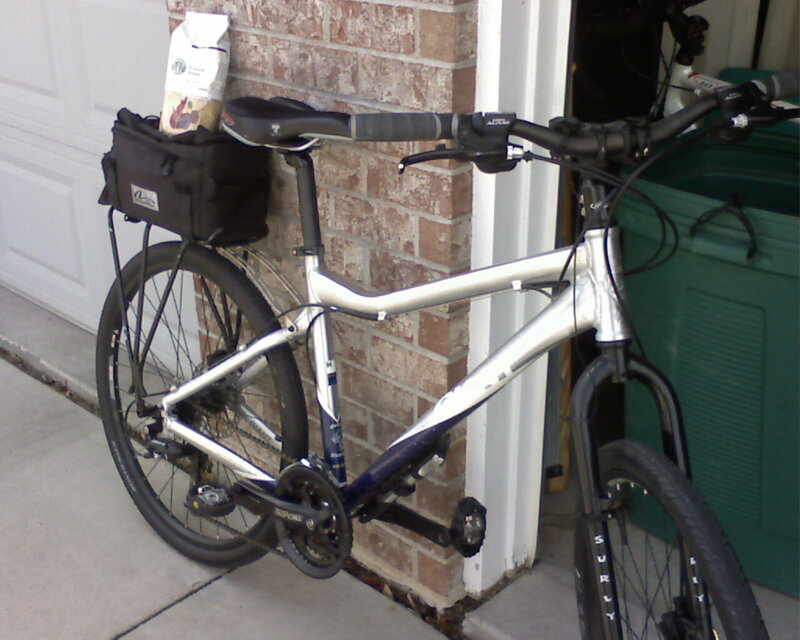 On Wednesday, April 14, 2010, I completed the task I had set myself, my first long distance bicycle tour, by arriving in southwest Denver at about 5:30 PM. 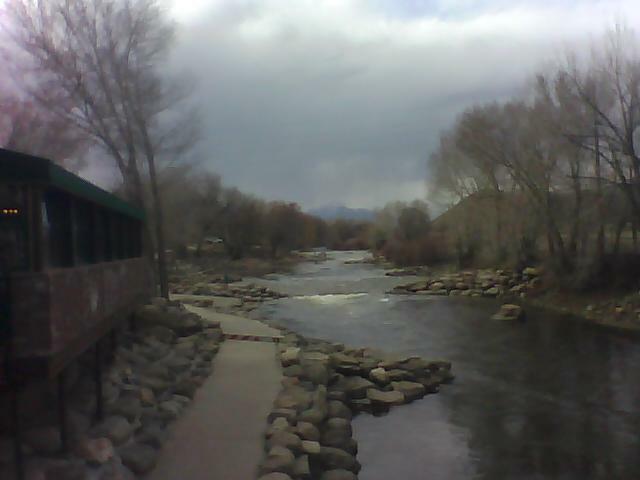 I had ridden about 48 miles from Salida to Fairplay, where I was given a ride to Denver, about 65 more miles. All I had to do now was get to Aurora on the east side of town, where Andi and Darryl would pick me up, another 13 miles or so. Here is an audio post of my thoughts as I began what became my last day on the road. I had no idea this would be the case as I headed north, out of Salida, that morning. Downtown Salida–­who knew they had one? 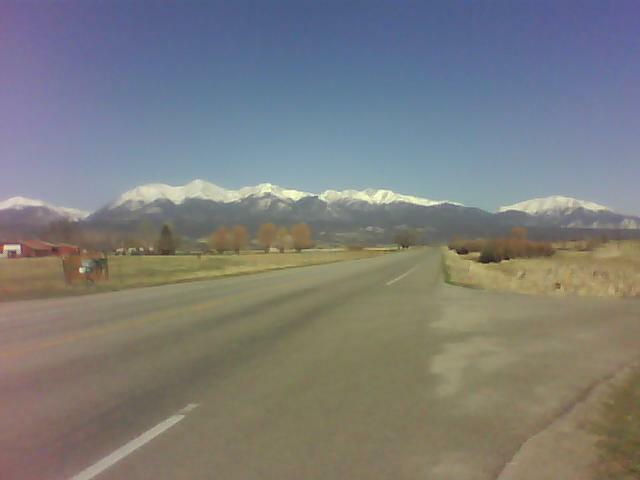 As I leave Salida this morning this is the view that greets me. At the time, I was so focused on simply reaching my destination, it didn’t really sink in that I’d done it. I was excited, yes, but also ambivilant; I’d made it home – the trip was over, except for that little matter of the 13 miles to the east side of town. Had I cheated myself by hitching that last ride out of the mountains? Well, as it turned out, I’d avoided a nasty snow storm in the mountains over the next two days. What would I do with myself if I wasn’t riding every day? I’d ride around Aurora and Denver and I would look for a job. Plus, I would be spending time with two great friends – and I would be seeing my daughter soon, as well. It’s odd but, focusing on such a serious challenge can become the complete focus of one’s life and, I’ll admit, no longer having that focus left me feeling a bit nonplussed. As I look back on the adventure a year later, I’m stunned to realize I actually did it. I don’t think I could even begin such a trek today. Not physically, and certainly not mentally. I’m simply not in the right frame of mind. Too comfortable, I guess. I can only say this, I hope this was not a one-time adventure, for I would truly like to be able to challenge myself in this way again someday. I think it appropriate, to mark the anniversary of my first long distance bike tour, to leave you with this; http://spokies.wordpress.com/, the link to another who has chosen to challenge herself with a similar adventure. Cherri is cycling the USA this year, and documenting it on WordPress. Give it a look. I think you’ll enjoy it. I had a couple of tough days after leaving Kim’s place in Durango. I actually rode 68 miles toward Pagosa Springs on the 10th; my longest ride ever. I was really proud of myself for this. There was a great deal more climbing than I had expected, but I also had a couple of long, free-wheel descents – finally – which made parts of the ride seem much shorter. 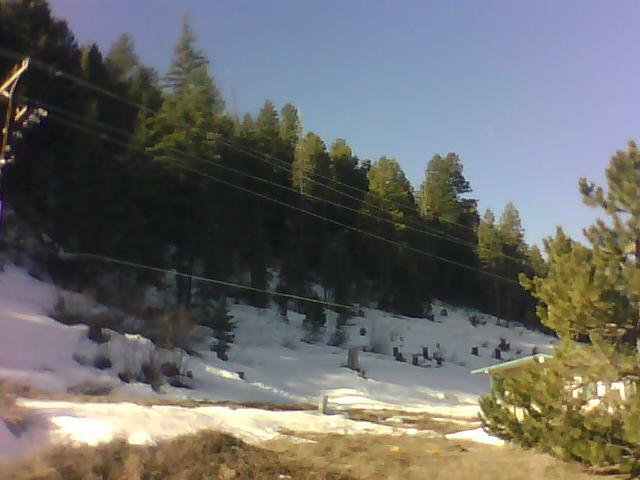 Waking to snow above me in Pagosa Springs, CO, April 11, 2010. As you can hear from my tone of voice in the first audio post from the 11th, I was feeling very sceptical of my ability to continue, much less finish, The Ride. I was looking at some huge climbs ahead of me, plus many miles of level ground as well. I’d been wakened by the very cold temperatures overnight in Pagosa, so was not well rested, and wound up feeling overhwlemed by the challenge ahead of me. Leaving Durango, and Kim's place, April 10, 2010. However, later in the evening, as a result of the kindness of strangers, I was feeling much better. I was suddenly in Salida, CO, a beautiful little town about a hundred miles southwest of Denver, with a room for the night, a hot shower behind me, and food in my belly. I’d only ridden 35 miles that day, but with two rides from strangers, one over 10, 550 foot Wolfe Creek pass, I felt as if I’d been delivered to heaven. To Joe and Jesse, my guardian angels on this day, Thank You, you have no idea how much I appreciate what you did for me. 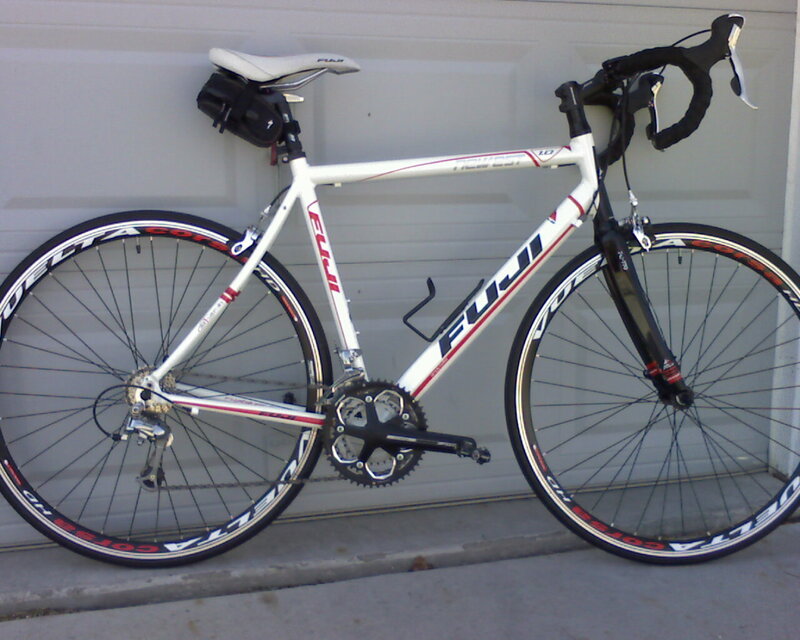 I got a new set of wheels for the Fuji today. I ordered them on Tuesday, the 5th, and FedEx showed up with them this morning. Needless to say, it took me about two minutes to get to our little shop in the garage and begin installing them. New Vuelta Corsa HD wheels on the Fuji, April 9, 2011. Inspecting them right out of the box, they were perfectly true, spoke tension was good, and they looked gorgeous. 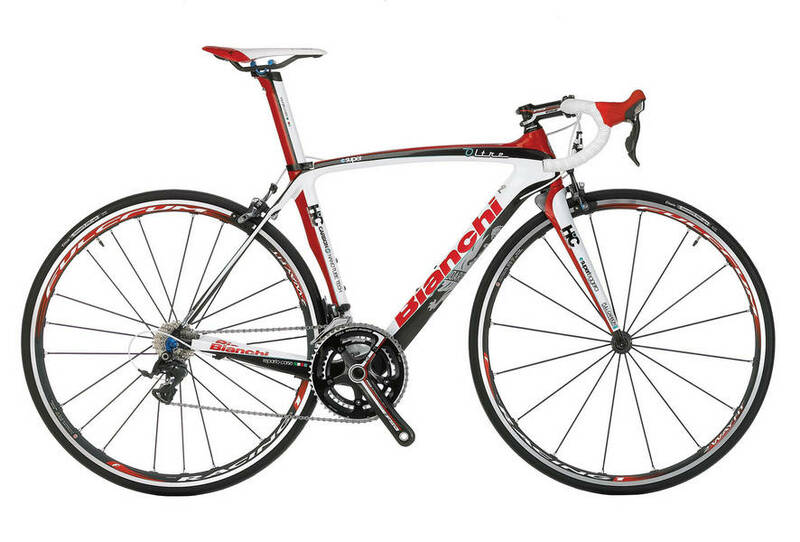 I knew right away, and when I ordered them, they would look great on the Fuji, because of the graphics on the bike. First of course, I had to clean the packing gunk off them. 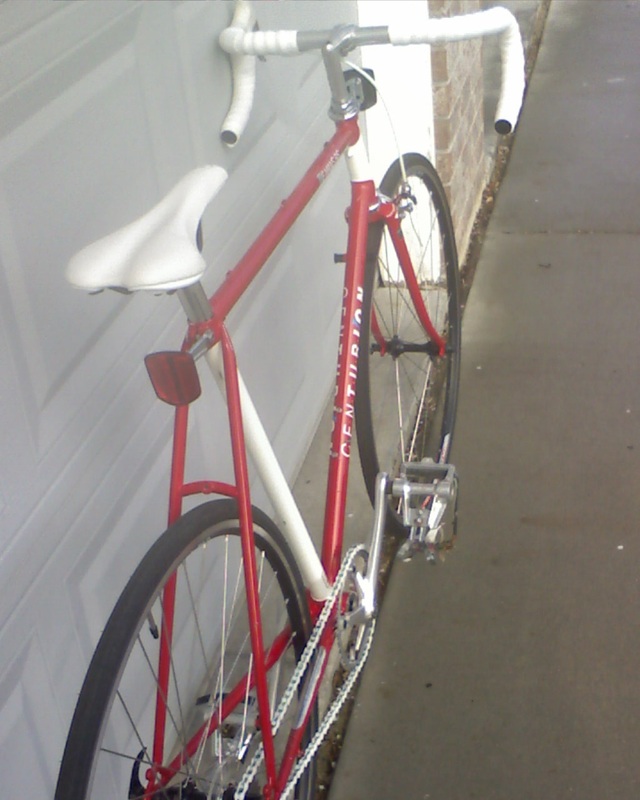 Next, I had to remove the old wheels, from which I had to remove the tires, tubes, and cassette, which I then installed on the new wheels. I figured, while I was at it, I’d clean the cassette before installing it on the new wheels so, about an hour later, I had ’em on the bike. Vuelta Corsa HD rear wheel. 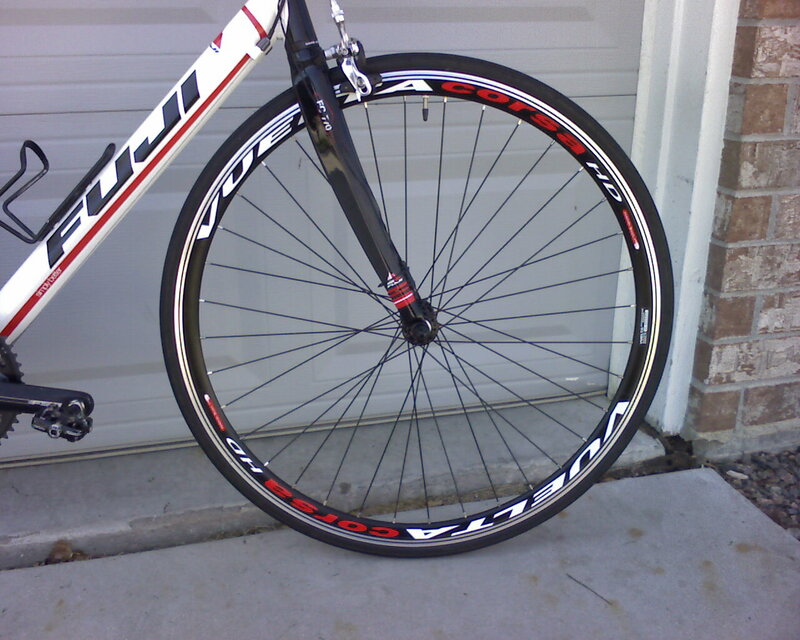 Vuelta Corsa HD front wheel. These are the hand-built Vuelta Corsa HD wheel set featured exclusively at Bike Nashbar, a great cycling website. 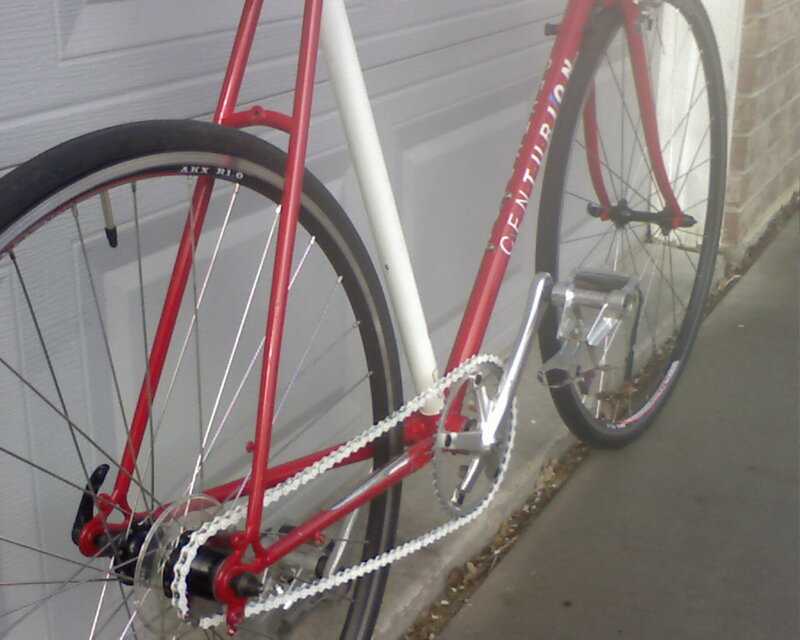 The “HD” stands for Heavy Duty, meaning they have 36 stainless steel spokes per wheel. 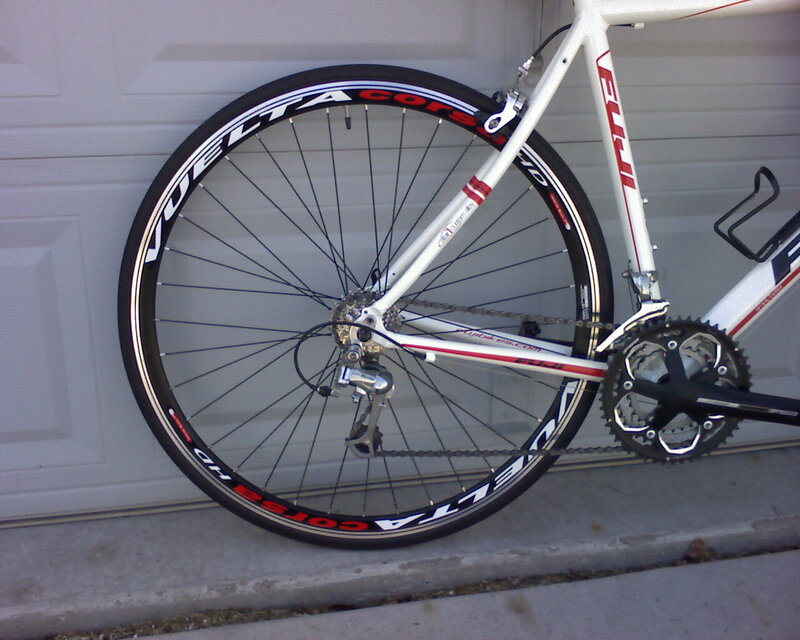 This makes them a bit heavy by most road bike wheel set standards, about a pound heavier than most in my price range actually, which tend to have 20 spokes up front with 24 in the rear; but at my size and weight that doesn’t really matter. What I was looking for was a wheel set which would not break down on me. I think I’ve found it. Of course, once I had them installed, it was time for a ride. A relatively quick ten miles later, I couldn’t be happier. I did some pretty good climbing with some fun descents, plus I rode into and out of the wind on some flat ground as well. I also hit some rather rough streets, to test the smoothness of the ride. The trails and streets I used for my first test ride are very familiar to me, as I wanted to test these wheel’s performance against what I am used to riding. They already feel smoother and faster, not to mention stronger, than the original wheels. Granted, ten miles is not much of a test, but I’ll be putting many more miles on them soon, I’m sure. Plus, it is, and has been, very windy here lately and I wanted to save some energy for the ride I know is coming when Darryl gets home from his Saturday job this evening. I’ll be posting a review of the wheels at www.milehicycleguy.com once I’ve put more miles on them. I’ll also review them at www.nashbar.com soon, as well. Oh, by the way, did I mention they look gorgeous on my bike? 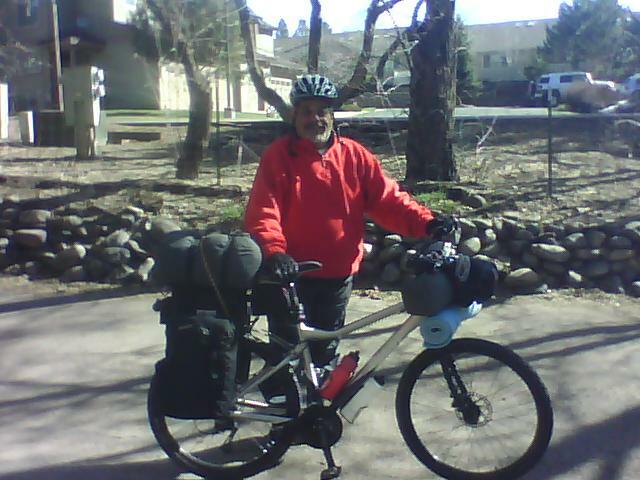 A year ago and two days ago, April 7th, I rode into Colorado from Arizon, by way of New Mexico. Needing coffee on Thursday morning, I rode the same bike a couple of miles down to Starbuck’s and back; sort of as a way of remembering that day. My Yukon and my coffee. Wow, what a difference a year makes. After riding road bikes so much over the last year, I’m not sure I could even begin to ride the Yukon so far again. The riding styles are just so different. Still, I do love this bike. It carried me through some amazing adventures last year. I’ll probably own it forever.